Comments: One of five species in this genus that occur in North America, all of which have been recorded in North Carolina. 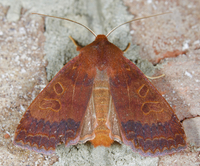 Adult Markings: Metaxaglaea semitaria, viatica, and violacea are all medium-large Noctuids with similar wing patterns: dentate postmedian and antemedian lines; large,red-encircled orbicular and reniform spots; and a contrastingly dark band between the postmedian and the subterminal lines. Externally, they differ primarily in color, which can be subtle and highly dependent on the lighting conditions. Violacea has a dark red-brown ground color overlain with a violet iridescence (see Schweitzer, 1979, for details). Adult Structural Features: Male genitalia are very similar to those of viatica, both possessing long, thin spines at the apex of the valves; in contrast, both australis and semitaria have short spines. Specimens of violacea usually have a dorsal spine on the cucullus on at least one of the valves, whereas they may be completely missing (or present) in viatica; see Schweitzer, 1979, for illustrations as well as more detailed descriptions. Immatures and Development: Larvae of violacea are usually more bluish-gray than the other Metaxaglaea and possess conspicuous black, post-spiracular tubercles (pinnacula) that are not found in the other species (Schweitzer, 1979; Wagner et al., 2011). Habitats: Corresponding to the distribution of American Holly, our records for violacea come from a wide variety of forest habitats, ranging from Maritime Forests to floodplain hardwoods to mountain ridges. Larval Host Plants: Probably stenophagous. Larvae have been found on American Holly but have also been reared on other evergreen species of Ilex (Wagner et al., 2011). Observation Methods: Like other Metaxaglaeas, this species appears to come well to both blacklights and bait. Comments: Although we still have relatively few confirmed records for this species, it appears to occur across the state, following the distribution of its common host plant. It thus seems relatively secure within the state. Comment: Wingspan = 5.0cm; forewing length = 2.5cm. 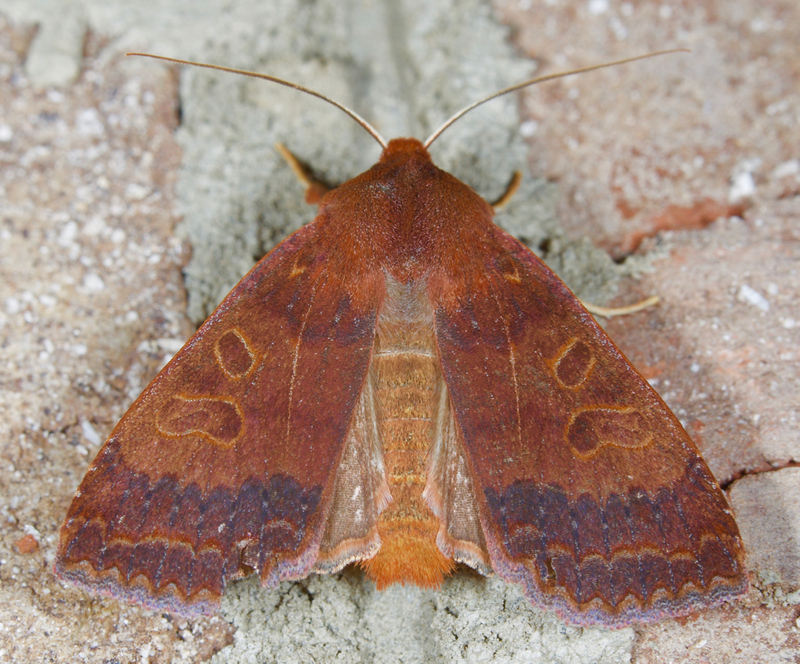 This specimen is worn but still has a trace of purplish-red scales in the basal areas of the forewings.